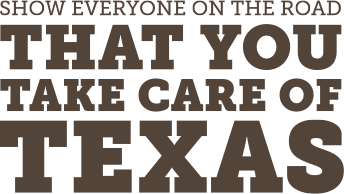 In this section, you’ll find ways to stay connected to Take Care of Texas, learn how to get exclusive conservation tips, and get tools to help spread the word! Whether you want to stay up to date with the latest on social media or get practical tips delivered conveniently to your inbox, you’ll find it here. These resources are useful for everyone, from teachers, to businesses, to reporters—or any proud Texan. Check out the links below to stay in the know! 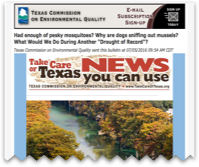 A monthly e-newsletter with helpful information on how to Take Care of Texas. Stay in the know with our informative regularly updated HOT WIRE blog featuring tips, stories, events and a lot more from across the State of Texas. Stay up to date with official News Releases featuring informative articles with downloadable graphics. Check out our current radio and TV spots! Download free environmental widgets to display on your website. Take Care of Texas Seasonal Tips is a quarterly e-mail with helpful ideas on how you can do your part every winter, spring, summer, and fall. Be sure and review the Take Care of Texas Public-Use Style Guide for rules regarding the usage of the TCOT logo.